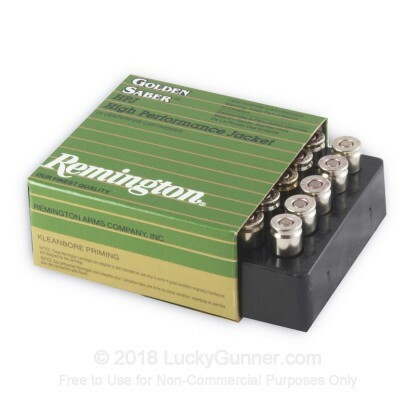 How does Remington 124 Grain compare to other 9mm Luger (9x19) self-defense loads? We conducted some tests with Clear Ballistics synthetic gelatin to find out. Following the FBI’s test protocol, we fired five rounds into the gel with a barrier of heavy clothing. We used a Smith & Wesson M&P9C because the short barrel is similar to the type of compact handguns that are most likely to be carried concealed. Images of the fired bullets suspended in the gelatin are in the graphic above. We measured the penetration depth of each bullet and then recovered them from the gel to measure the expanded diameter. You can find all of that data in the chart at the bottom of this page. Photos of the recovered bullets are below on the left and a slow motion video of the first bullet fired into the gel is down on the right. 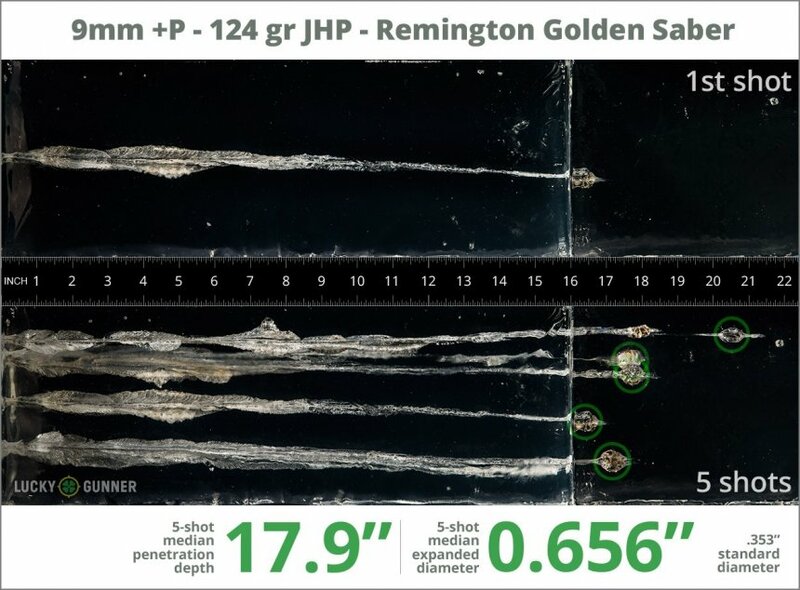 If you’d like to know more about our ballistic gelatin testing and see the results from over 150 other self-defense loads, check out the article on Lucky Gunner Labs. 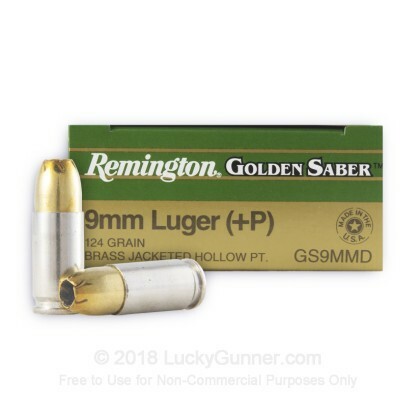 0.90" This ammo: 0.66" Min: 0.32" Median: 0.50" Max: 0.90"
WHAT A DEAL!!! Fifty cents per round for $1 per round ammo. That plus quick delivery. Truth be known, UPS and the like don't want the responsibility for bullets on their trucks any longer than they have to be there so bullets get delivered quickly. I will say that LG wastes no time in getting your item on that truck. Thank yous to the Warehouse Manager. Ammo delivered "on time with a shine" when expected and price couldn't be beat! Your product was a good value. I kept all on the target...I had not been to the range for a while. About 120 rounds downrange, the weapon was not tough to clean. No problems with any cartridges. Will buy again when supply drawn down a bit more. Thanks LG. Great ammo. No problems. I'll buy again. All you have to do is look at the Muzzle Energy spec to see that this round means business. Then look at the jacketing and you'll quickly come to the conclusion that this round needs to be on your list. It has a very smooth recoil, and low flash. Excellent groupings put this round on top of my list. Has almost the same ballistics as Ranger NATO, another great round. Trust me. 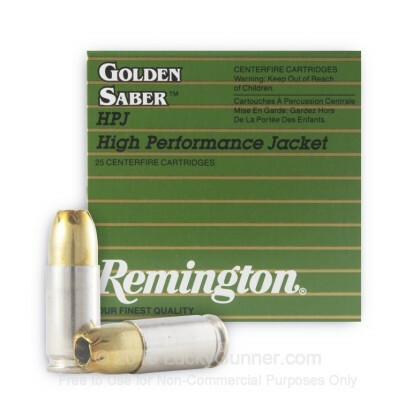 You will not be disappointed with your purchase of these Remington Golden Saber (124gr, +P, JHP) cartridges. My SR9C loves them. Also...and equally important, you will not be disappointed in making your purchase from Lucky Gunner. They are very reputable and ship your purchases quickly. This is a win-win. Buy some today.